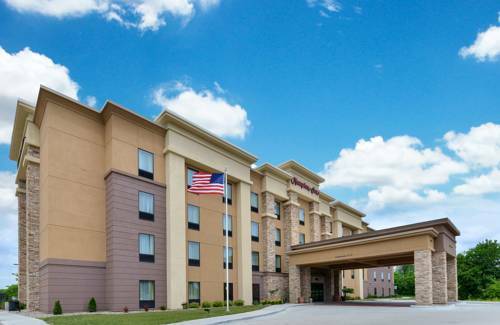 The Hampton Inn Iowa City/University Area is the best choice for travelers coming to the Iowa City/Coralville area. Our spacious contemporary guest rooms are all smoke free and designed to meet the needs of all travelers. Located along the Iowa River our hotel is ideally located just a few minutes from the University of Iowa campus and UI Hospitals - Clinics. While in Iowa City take in the beauty of the historic downtown area which includes Iowa*s first capital building as well as many shopping and dining options. Stop by our front desk and one of our friendly guest service agents can inform you of any festivals that may be occurring downtown as well. If you are in town for an Iowa Hawkeyes home football game you will enjoy our close proximity to Kinnick Stadium which is less than 2 miles from our hotel. Start your day off right with our On The House hot breakfast buffet which includes many healthy and satisfying options including fresh baked waffles and hot oatmeal. Whether you are in Iowa City for business or leisure you can always stay connected with our free high speed wired and wireless internet located in the guest rooms and throughout the hotel. Unwind in our indoor pool - whirlpool or get energized in our state of the art fitness center. The Hampton Inn Iowa City/University Area is the perfect location for any traveler especially those looking to enjoy the Hawkeye way of life. All reservations must be guaranteed with a major credit card or advance cash deposit to hotel regardless of time of arrival. All reservations must be cancelled 6 PM host time unless deposit is required. Policy is subject to change. ~64 miles from Iowa City.